The Grand Marshal of the 2018 New York City St. Patrick’s Day Parade takes our questionnaire. When Loretta Brennan Glucksman’s grandparents immigrated to Pennsylvania coal mining country, the last thing on their minds was making the trek to New York City for the annual St. Patrick’s Day Parade. “That was outside the realm of possibility,” she says. Her father’s family, the Brennans, were brewers from County Donegal, and her mother’s family, the McHughs from County Leitrim, worked in the mines. 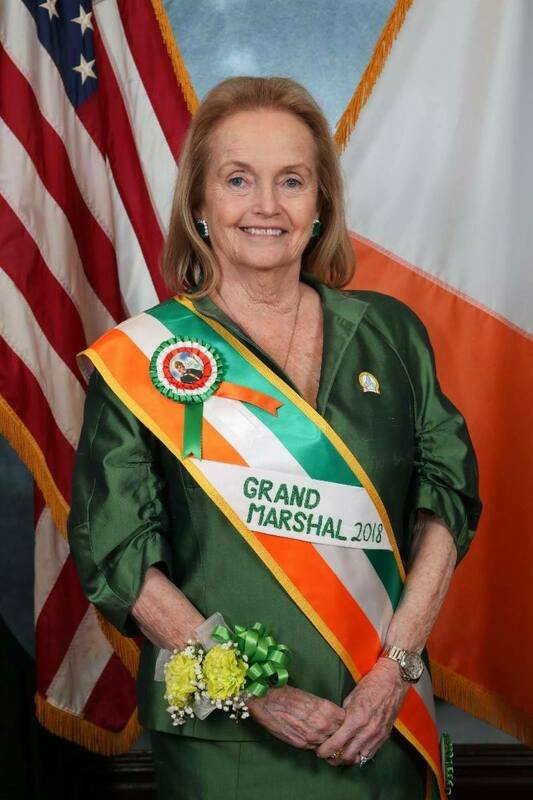 This year, she will carry on the classic immigrant tradition of generational improvement by serving as Grand Marshal of the Fifth Avenue parade, becoming only the fifth woman in the parade’s 257-year history to wear the sash. 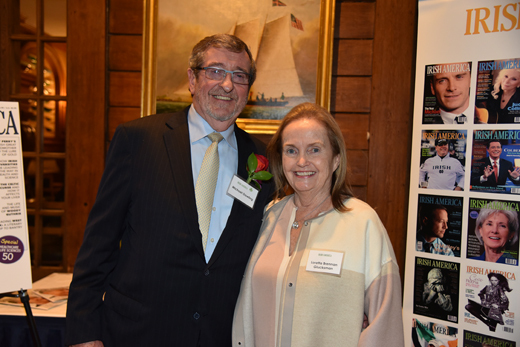 A member of the Irish America Hall of Fame, Brennan Glucksman has worked tirelessly towards promoting Irish culture and broadening access to education. 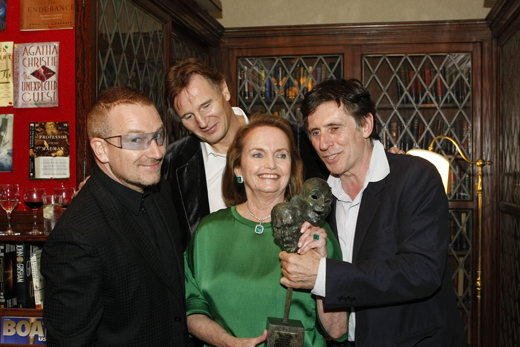 In 1993, she co-founded Glucksman Ireland House, New York University’s center for Irish studies. 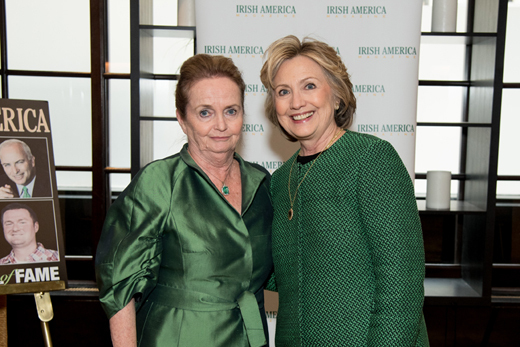 From 1995 to 2014, she chaired the American Ireland Fund, where she currently serves as chairman emeritus, and serves or has served on the board of directors for the University of Limerick Foundation, Trinity College Dublin, University College Cork, and the Royal Irish Academy. She has contributed to the peace process in Northern Ireland by funding two integrated schools for Catholic and Protestant students and was also instrumental in the development of New Jersey’s public access television programming. Born in 1938 in Allentown, Pennsylvania, Brennan Glucksman excelled early in school, a fact not unrelated to a club foot that prevented her from participating in much physical activity until late childhood. Instead of playing with her siblings and friends in the street in front of their house, she would sit with her grandfather on their porch listening to him recite Irish poetry and studying the dictionary. Eventually, her parents found a surgeon in Philadelphia who practiced experimental techniques in bone resetting and repaired her foot, but the learning stayed. She earned a teaching degree in Philadelphia, married her college sweetheart, and had three children. The marriage didn’t last and Brennan Glucksman set out on her own across the Delaware River, landing at Trenton State College to study early childhood education at the same time the college was granted a public television license, in 1968. By the time the station launched in 1971, she had begun teaching English and was offered a book program on the network, from which followed an offer to host a weekly news show, which led to work at WNET, where she stayed through the 1970s and ’80s. 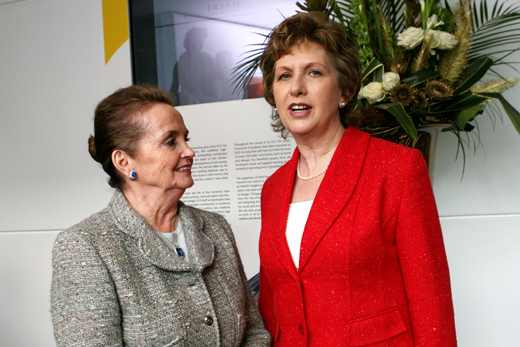 Lew and Loretta Glucksman with radio drama producer Barbara Bray at Dublin’s Trinity College, February 1997. 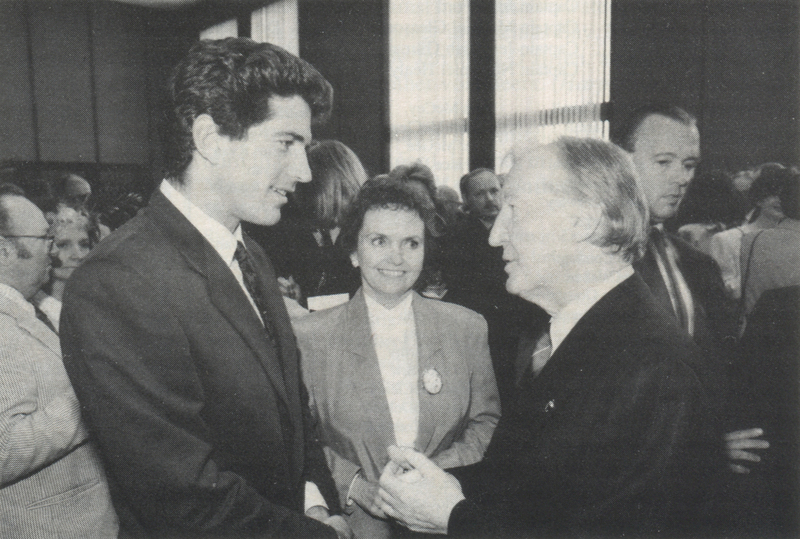 John F. Kennedy Jr., Loretta Brennan Glucksman, and former Taoiseach Charles Haughey at the announcement of the creation of NYU’s Glucksman Ireland House, May 20, 1991. She left television and founded the public relations company Westland Associates with her daughter, Kate, so she could spend more time with Lew. 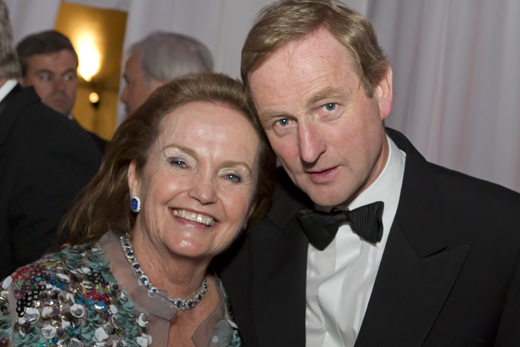 Soon, the travel, which was tied explicitly to her selfless devotion to promoting Irish causes in the U.S. and abroad, took over and she rolled in the company in order to “hang around with my husband,” as she modestly puts it. What does it mean to you to be named Grand Marshal? It’s still kind of unworldly to me. I can’t quite believe it. It’s such a cohesive part of our community and its longevity is such a source of pride for most Irish Americans, so I’m just so humbled and grateful that they chose me for this amazing honor. What would your parents and past ancestors think of the honor? All I can think of is that they would be over the moon, as they would say. Just thrilled. 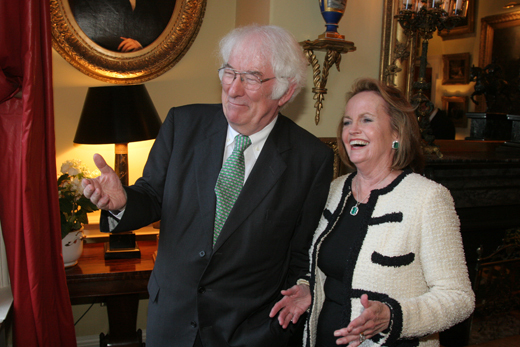 Loretta Brennan Glucksman with Seamus Heaney in 2006. I would sit on the front porch of our home and my grandfather, who lived next door with my grandmother, would sit with me while the other kids were on the sidewalk playing and he would teach me Gaelic and read me poetry. He would quote poems to me in Gaelic and then in English, and then I would have to repeat them to him. And he used to read the dictionary to me and then quiz me on it later. So I have those early memories of me sitting on my little rocker and Pop Pop was on his big rocker and just sopping up everything he said to me. He was a wise, wonderful man. Was there a sense of Irish heritage in your home? It was very cohesive, though also somewhat dichotomous. I never had a thought that I would go to Ireland. My grandparents were of the “Irish wake” generation – when they left, it was forever. There was no possibility, especially in our economic bracket, that they would be jumping on a plane and going back. So it was quite poignant, and maybe therefore that much more passionate. My grandparents would never allow anyone to speak Gaelic in the house. They were all about assimilation, so my little furtive lessons with Pop Pop on the porch would not have happened in the dining room, because himself and Nana – Nana being the powerhouse in the family – wanted American children. They did not want Gaelic-speaking children. People who did all the horrifyingly hard work to get over here did not want their children being anything but thoroughly American. I’ve always been a little bit reluctant about that, but I was very lucky in that Pop Pop did make sure I got it a lot. A lot of my Gaelic language still comes back to me – you know, like in your lizard brain. I can still somewhat say my prayers and a few poems in Gaelic, so I’m very grateful for that. Seamus Heaney, Colum McCann, Dan Barry, Alice McDermott, and John Banville. 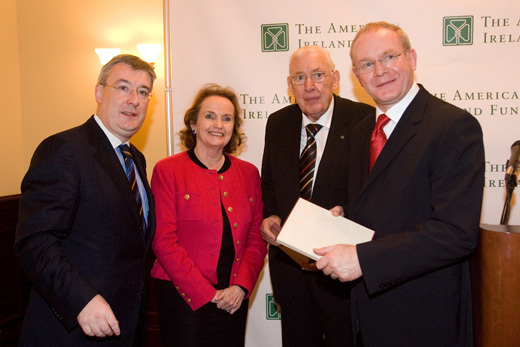 President of the American Ireland Fund Kieran McLoughlin, Loretta Brennan Glucksman, Ian Paisley, and Martin McGuinness in 2007.
Who is your favorite Irish writer? There are quite a few, but the biggest ones would be Colum McCann – I love Colum’s writing, starting of course with Let the Great World Spin, but way before that, Zoli and Dancer. He’s just a gifted writer. And then Marie Heaney, Seamus’s widow, is a beautiful writer, a beautiful poet, and I love her work. And Peter Fallon, who is also a brilliant poet and a generous publisher as head of the Gallery Press. Pete Hamill, my hero, is not only a gifted writer, but one of the best human beings ever. Ed Doctorow forever and ever. A wonderful man, wonderful friend, and brilliant writer. From that saintly doctor, Dr. John Royal Moore, who fixed my leg. It was hard, and when I would be so down, he would say, “You can do this. Never give up.” That filtered through so many aspects of my life. I owe Dr. Moore so many things, and that’s one of the big ones. Be ready to work as hard as you physically and emotionally can. Seek out mentors and be sure that they are realistic and are willing to be generous. And keep a sense of realistic humility – try to know your limits and work against them. What movie will you watch again and again? Anything but The Quiet Man. There are so many other, wonderful movies – 12 Angry Men to name one – from that rich period post-World War II. And really all the way up to about 10 years ago when I think I lost the plot of what movies were about. You’re hosting a dinner party. Dead or alive, who would you invite? For sure Oliver Sachs would be at the table – a brilliant, loving, wonderful man. Seamus Heaney, of course. And for sure my three children, who of course are all in their late 50s, but are still my children. They are three of the most interesting people I have ever known. Do you strike up conversations on long flights? God no. When I get on a plane, I’m usually, first of all, wanting to let down and relax after all the hustle of getting on to the darn plane, especially dealing with airports these days, which are just the ninth circle of hell. So when I get on that plane, I look at it as a tube that makes me just want to curl up and not talk to anyone. 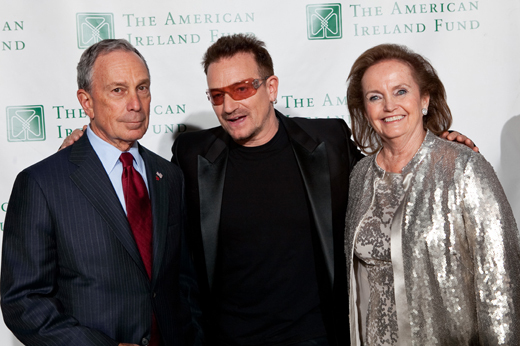 Former New York City Mayor Mike Bloomberg, Bono, and Loretta Brennan Glucksman in 2010. Well, if it hasn’t shown up by now, I really don’t have much hope that there’s something hidden in me. What is your favorite quality in friends? I treasure humor. And most especially loyalty and kindness. My perfect day would be one where I have no events scheduled. 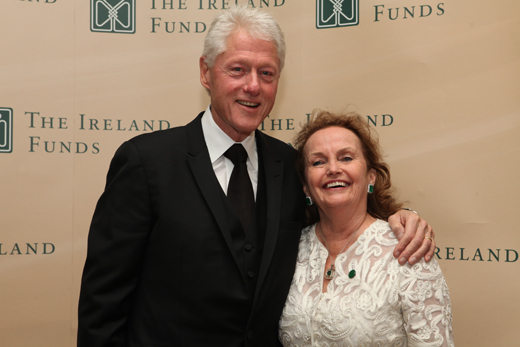 Loretta Brennan Glucksman and former President Bill Clinton in 2010. I love to cook, and my favorite meal to cook is Thanksgiving dinner. I have to say I don’t love eating turkey so much, but Thanksgiving is such a wonderful celebration of family and togetherness that it makes the meal such a delight to cook. But for more everyday stuff, either meat loaf or Irish stew. And for a treat going out, anything at Otto, which is my local downtown. Your favorite place in Ireland? Adare, County Limerick; Cobh, County Cork; and the Merrion Hotel in Dublin. The three pillars of my life in Ireland, where Lew and I spent so many happy years, were those three places. What do you do to relax and clear your head? Read. I escape into reading. I cannot go to sleep, or I shall not go to sleep, without reading. I swim, which is great, especially for an aging body because it doesn’t damage your bones the way running or tennis does. And then just being at our place in Rhinebeck. I feel my metabolism ratchet down as soon as I go up that hill. So I’m very lucky to have that. It’s a place that Lew had since 1973 and it’s just a time machine, very peaceful and calming. Nice article. Great to see Irish-Americans who have given so much, put in the limelight.